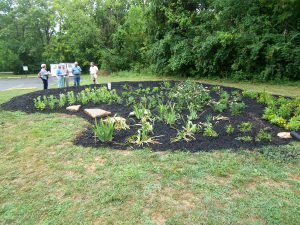 Rain gardens look like any other flower garden, but they are built in a shallow depression that is designed to collect rain water and slowly filter it into the ground over a period of a day or two. Unlike a wetland, rain gardens are designed to be completely dry after a maximum of two days, so standing water is not a problem. Good locations for rain gardens are areas where rain water collects during a storm, such as below roof downspouts, small grassy waterways, or parking lot islands. They are not well-suited for areas where water tends to stand for more than 48 hours. Concerned about mosquitoes? No need to be. In fact, because rain gardens are designed to be dry within a day or two after a rain storm, they can act as mosquito “traps.” Mosquitoes may lay eggs in the garden when it is holding water, but because it dries out so quickly, the larvae die before they can hatch. Rain gardens help keep our streams and rivers clean by filtering “storm water runoff” (rain water from rooftops, driveways, lawns, parking lots, roadways and sidewalks) before it enters local waterways. Rain gardens also help alleviate problems associated with localized flooding by encouraging water to soak into the ground, thereby reducing the volume of runoff. Just as important, rain gardens add beauty to our community. Anyone can build a rain garden on their own. Creating one requires nothing more high tech than a shovel. Check our Quick Guide to Planning and Installing Rain Gardens to see how easy it is! The links on the left provide even more tips and guidance on constructing your own personal rain garden. And if you run in to problems – don’t give up. Just give us a call (732-7075) or shoot us an email and we’ll help you through it. Photo (above right): Pattison Park rain garden shortly after planting in 2008.